Give our dogs a safe place to play! Whistler Animals Galore Society hasn't added a story. 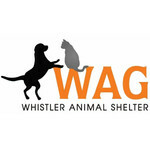 WAG (Whistler Animals Galore) is a not for profit shelter that rescues dogs and cats from the Sea to Sky corridor. Due to the Nesters and Garbage depot expansion, WAG is LOOSING OUR OUTDOOR GRASS RUN AND TREES!!! Though a new, smaller area has been proposed by the RMOW, WAG is in need of the community’s support to develop an outdoor dog run area that is SAFE, SECURE, and USABLE. By November 30th, WAG must raise a minimum of $40,000 from a variety of sources to ensure the dogs in their care will have the best possible support and safe access to the outdoors. “We believe a safe, protected and interactive outdoor place to socialize and exercise is vital for the health and happiness of our shelter dogs who call WAG home. We are looking to the Whistler community and visitors to support our fundraising for a safe and secure fence option,” says Lindsay Suckling, WAG Shelter Operations Manager. A new dog run will be constructed at WAG; however, it will require a SOLID fence to ensure dog safety and wellbeing. WAG’s priority is the safety and welfare of its animals while also ensuring WAG remains a good neighbor in the Nesters area. Why is WAG choosing solid fencing? 1) Protects against garbage entering the dog run. 2) Protects against negative human and dog interactions, such as fingers being stuck through the bars, yelling, feeding of food, etc, often leading to increased frustration and reduced adaptability. 3) Reduces the risk of disease/illness transfer. 4) Solid fencing will be set 6 inches into the ground, preventing dogs from digging under the fence, or rats from digging in. 5) Reduce noise pollution (garbage trucks, traffic, bottles smashing, etc.). Many WAG dogs are fearful due to past neglect or abuse and will not be able to tolerate the noise. -Socialize:training sessions, enrichment activities and play with each other, adopters, staff and volunteers, increasing adaptability and allowing more animals to be rescued. -Comfortably relieve themselves. Many dogs in WAG’s care have never been on a leash and are scared to walk near the busy highway. 1) Donate to WAG to ensure a safe, outdoor space for our shelter dogs and puppies! Donations are accepted online at www.whistlerwag.com in person on Friday, Saturday and Sunday, over the phone and by mail. 2) Spread the word to your networks of our exciting new project and need for funding! 3) Become a trained Shelter Volunteer. You can help the animals with enrichment activities, socialization, and walking. 4) Become a foster parent and help an animal get prepared for their forever home. There will be no grass, dirt, or trees in the new run,­­ which are a necessity for the health and wellbeing of our animals. The newly relocated dog area will be smaller than our previous one and square/rectangular. Many of our dogs are high energy or love to play fetch, and running is integral to using up excess energy and reducing frustration. In an effort to replace their ability to run, we are planning to build an interactive structure for dogs, including features such as multi-level houses, ramps, stairs, perches, tug stations, and more. The existing dog-run will be closed THIS FALL due to nearby expansion at the garbage depot and Nesters area. With the loss of the outdoor space WAG staff will need to focus more time and resources on animal welfare, enrichment, adoptions and training our shelter volunteers. WAG is very fortunate to have amazing supporters, foster homes and volunteers. We know WAG will be able to continue to enhance the lives of animals in WAG’s care with your ongoing assistance. We thank you for your support! Whistler Animals Galore Society hasn't posted any updates yet. Whistler Animals Galore Society is managing the funds for this campaign. Whistler Animals Galore Society is a verified organization.